SUGAR | MICHIGAN GROWN. MICHIGAN GREAT. Nature’s preferred sweetener, sugar, is abundant in Michigan! Michigan sugar is a “real sweet” deal for our state’s economy, and it’s available to Michiganders and neighboring states all year long. Sugar has 4 calories per gram, 15 calories per teaspoon. Sugar is pure sucrose and contains no preservatives or additives of any kind. 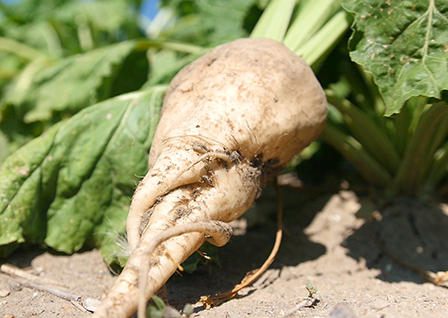 To consumers, “sugar” means table sugar or sucrose, obtained from sugarbeets or sugarcane. In a food’s ingredient statement, “sugar” always means sucrose. During digestion, sugars such as sucrose (table sugar) and other carbohydrates such as starches break down into simple sugars. These then travel through the blood stream to body cells where they provide energy and are stored for future use. Researchers do not know why diabetes occurs, but they know sugar intake does not cause it. Diabetes is a disorder in the way the body handles sugars. Extra calories may come from any energy-containing nutrient (proteins, fats, carbohydrates and alcohol). As carbohydrates, sugars actually contain fewer calories than fats and alcohol.